The Polish Jinx: Lise Watier Festive Winter Collection Swatches! Earlier I showed you these two new polishes from Lise Watier, and while I was initially not excited about one of them, in person they were both GORGEOUS and I got both! Festive Chic is a berry toned glitter bomb. Very similar to both Lippmann Good Girl Gone Bad and Razzle Dazzle. It applied smoothly and nicely, and two coats was more than sufficient. Fairy Taupe is a shimmery multi tone taupe that was........... problematic in application. It was almost a frost, and a PITA to apply. As you can see in the swatch, even with three coats you can still see brush strokes. Now the other feature with these polishes is a light which is in the cap. The very top of the cap has a button you push and then a light goes on. I really dont love this feature and hope it is a one time thing. The shape of the cap is uncomfortable to hold because of the light, and really??? When are we ever going to need this? Yes, I may one day have a black out and be actually able to do my nails, but really? I'd rather save my two dollars and skip the light. 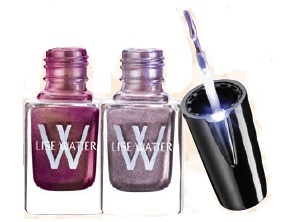 These polishes retail for $14.00 instead of the normal $12.00 and are available wherever Lise Watier cosmetics are sold (select Bay stores, select Shoppers and London Drugs. If you want them I would go quick though, seems counters got 2 or 3 of each polish and that was it!